Construction could begin as early as 2015 if State and Federal environment ministers give the plan their seal of approval. With boaties campaigning for at least 40 years for a marina safe haven in Rockingham, local environmentalists are predictably outraged and Hands Off Point Peron founder Dawn Jecks will lead a peaceful protest at the West Perth offices of proponent Cedar Woods next Wednesday morning. She will continue to Parliament House to hand over an 8000-signature petition appealing for the Legislative Council to abandon the proposal and support development of the Peron land into an ‘A’ class reserve. ‘It is clear the EPA and the State Government are not prepared to protect the interests of ordinary people against greedy developers and the politicians who are pushing for this destructive development,’ Ms Jecks said. Cedar Woods state manager Stuart Duplock said while some in the community may continue to oppose the proposal, he believed the decision would be widely accepted locally and in the broader community. ‘Comprehensive community consultation demonstrated that the proposed Mangles Bay marina was supported by the majority of the community on the basis that it achieved environmental approval,’ he said. EPA chairman Paul Vogel said the authority had thoroughly examined the Mangles Bay proposal at the highest level of assessment and recommended approval subject to a suite of strict conditions to protect the area’s environmental values. 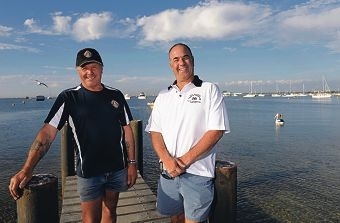 Under the plan, The Cruising Yacht Club of WA (TCYCWA) and Mangles Bay Fishing Club are likely to join forces at shared facilities at the new marina. TCYCWA Commodore Steve Gorbould said he was optimistically cautious environment ministers would approve the marina in line with the EPA’s recommendations. ‘I’m pretty happy about the EPA’s decision. It is a big step towards finally having a marina in Rockingham,’ he said.